A Danish zoo says it is planning to dissect a lion in front of an audience, saying that its heart, lungs and other body parts will be displayed. Similar cases of killing and dissecting animals a year ago in another Danish zoo sparked public outrage and criticism. “Be there when one of the zoo’s employees dissects a lion. There will be explanations when the animal is cut up and the heart, lungs and other body parts will be displayed,”says a statement on the zoo website. If the audience wishes “to closely study body parts, that will be possible and the whole thing will be geared toward dialogue,” the zoo added. However, the lion won’t be slaughtered in front of the audience, it will be only dissected. The animal has already been killed and put in a freezer. It wasn’t sick or weak; the healthy predator was reportedly killed due to the overpopulation of lions in the zoo, according to The Local. “We are doing it to show how fantastic a lion is. There are many physical adaptations needed to be the top predator on the savannah. That’s what we will focus on and show our guests,” zoologist Michael Wallberg Sorensen told Danish TV2 Fyn. Sorensen said he hopes that the reaction in media won’t be similar to the one that stormed Copenhagen Zoo in February 2014. The zoo publicly killed and dissected an 18-month-old giraffe named Marius “to avoid inbreeding” and “educate” children on its anatomy. “We haven’t previously experienced people getting angry so we don’t anticipate it this time either,” Sorensen said. It turned out that Odense Zoo already dissected a lion in January this year, but the event received little attention. 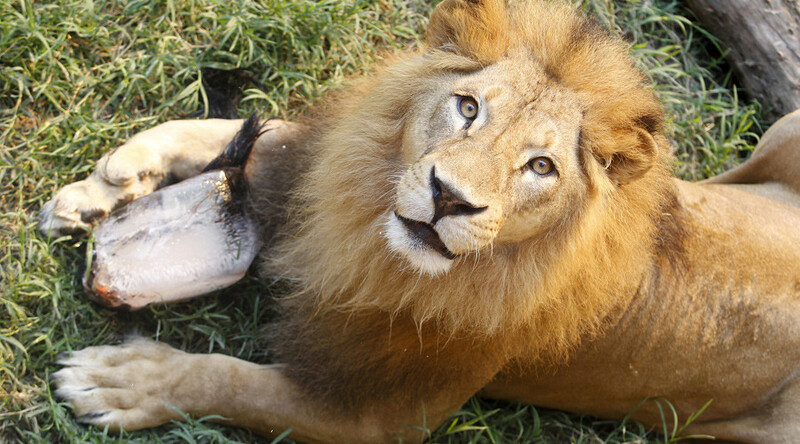 The 2014 killing of the perfectly healthy lion, Marius, prompted thousands of activists to lash out at the zoo’s stance and flood its Facebook page with outraged comments. Danish zoo officials even began receiving calls and messages containing death threats. However, death threats didn’t stop the Copenhagen Zoo. Just a month after the slaughter of Marius, the zoo put down two lions and their two cubs to make room for a new male lion.